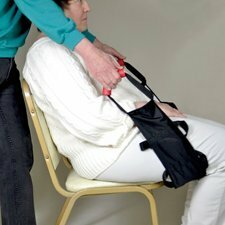 Makes the process of sliding a person to the back of a seat easier and safer for both the patient and the caregiver. Reduces the risk of bruising and injury caused by grabbing the individual or their clothing. For use on chairs, wheelchairs and transport chairs. Smooth surface on one side reduces friction while the non-slip material on the other end allows the patient to be safely repositioned to the back of the seat. Soft, built-up handles are easy to hold and reduce stress on the caregiver's hands. 46" (116.8 cm) long with 3 sets of handles to accommodate various sized individuals and seating scenarios, and to reduce stress on caregiver's back. Width - 5" (12.7 cm), handle strap length - 4.5" (11.4 cm), handle diameter - 1.2" (3 cm).